This release weighs in at 11% ABV. This beer is black with some ruby highlights. The nose is full of pumpkin pie spices and some alcohol. There are notes of nutmeg, caraway and vanilla. 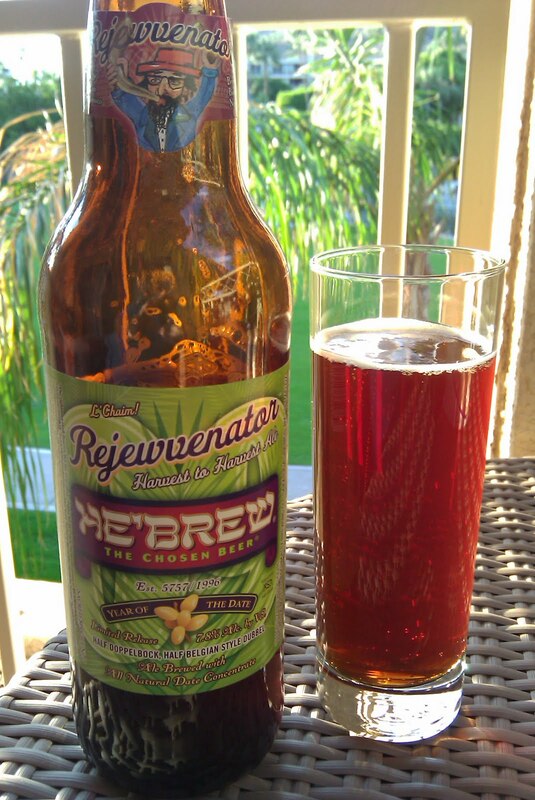 The taste starts with chocolate malt with a hint of spice and rolls into a warm spicy alcohol taste which has the effect of creating the balance that usually comes from the hop bitter. There is some hop bitter on the finish, but not much. 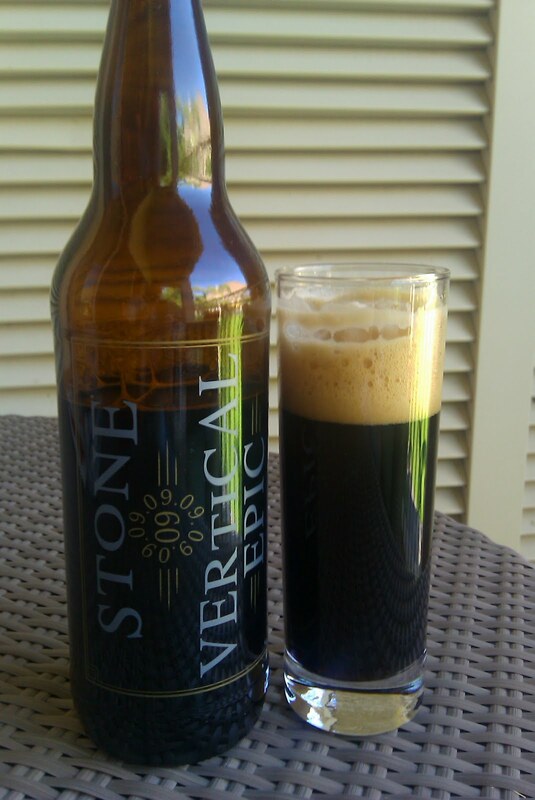 Overall, this beer finishes relatively dry for such a big beer. As it warms, the spices move forward in the taste and the chocolate moves to the finish. 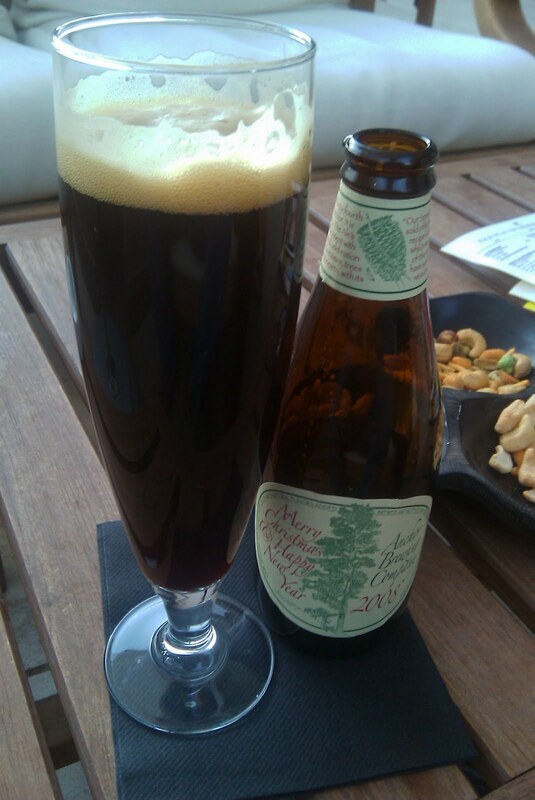 The pumpkin provides a pleasant undertone and a round mouthfeel. The Flying Saucer in Houston will be tapping BrewDog's Dogma on Thursday starting 7:00pm. James Watt, co-founder of BrewDog will also be on hand to talk about the beer. It would probably be a good opportunity to talk to him about Tactical Nuclear Penguin, the biggest beer ever made by a human or a penguin. Following on the heals of Tokyo, a 12-percent imperial stout, BrewDog Brewing continues to brew up controversy as well as strong beer as it takes the title of World's Strongest Beer from Sam Adams and their Utopias. My wife and tried out the new Yard House in Houston last night. Its located in the middle of the brand new City Centre development at I10 and Beltway 8 on the West side of Houston (and more importantly, very close to our house). The whole development is very modern and contemporary and there are a few other upscale eateries already open such as RA Sushi, Eddie V's and Straits. 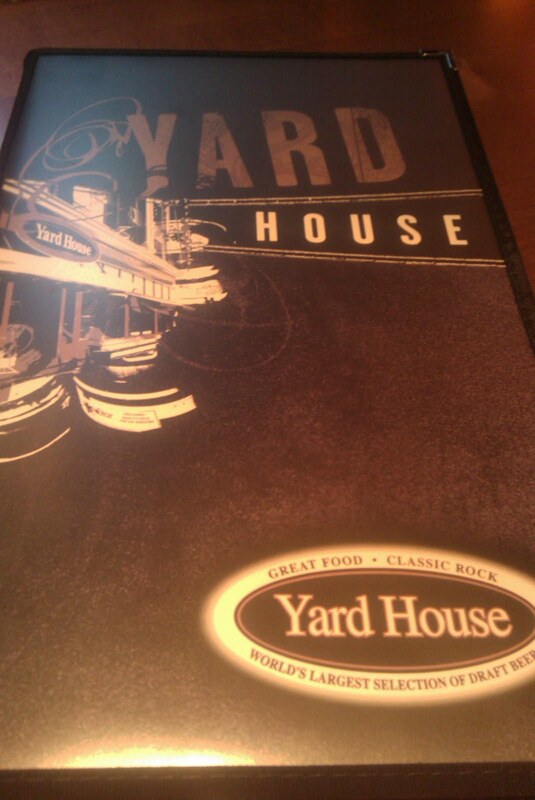 I've been to a few other Yard House locations around the country and they all generally have the same look and feel. This location seems a little smaller then other locations, but they do have a very large patio area on two sides that looks out over a large open courtyard. 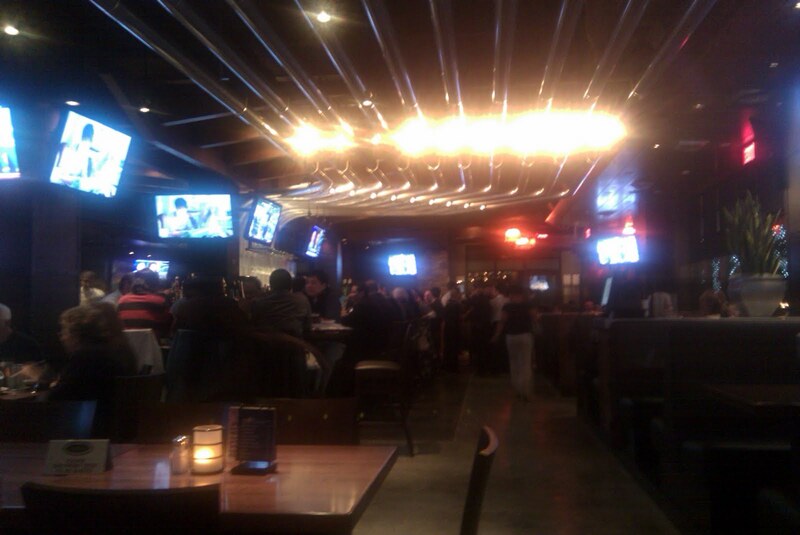 A large racetrack shaped bar is in the center of the restaurant with ~100 beer taps wrapping around the inside wall. The kegs attached to all those taps are contained in a glass-walled cooler along the end of the restaurant with pipes running overhead from the cooler to the bar. Loud classic rock music was playing while about 20 flatscreen TV's were tuned to various channels. We arrived around 5:30 and were seated immediately in a booth along the glass windows of the keg cooler. The menu is large with a good assortment of unique variations of familiar items as well as the usual favourites. We started with spinach cheese dip served with crispy flat bread. For dinner, we shared the Spicy House Salad and the Spicy Thai Chicken Pizza. The salad was very fresh and crisp with a light but spicy dressing. The pizza was done perfectly with a thin crispy crust and the macadamia nuts added an extra little crunch to it. Overall, we were both very happy with the food. The service was also excellent and we were never left looking for someone to refill our water glasses or order another beer. However, the beer menu was what I was most interested in. 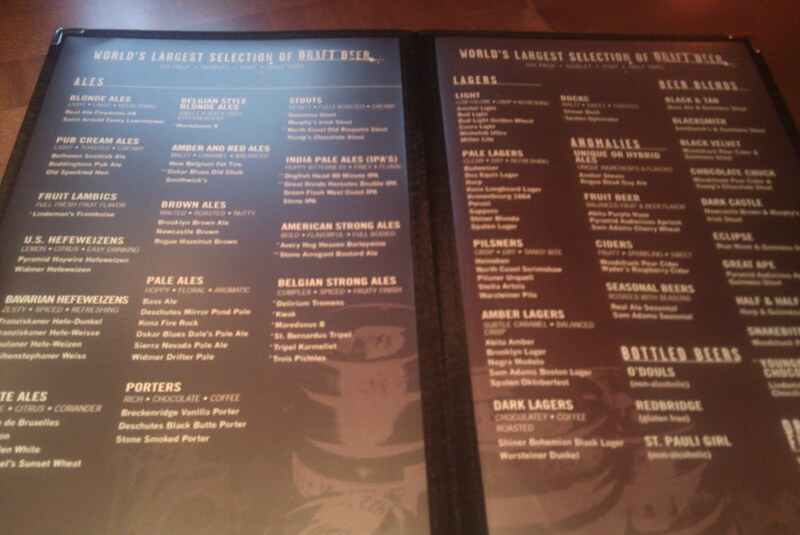 I counted 87 draft beers on the menu, including all the macro lagers. There is a good assortment of ales and lagers with a larger selection of Belgian beers then I expected, but there's nothing too out of the ordinary. I didn't have a hard time finding something I wanted to drink, but don't expect to find any rare or extreme beers either (go to the Petrol Station if you're wanting those). 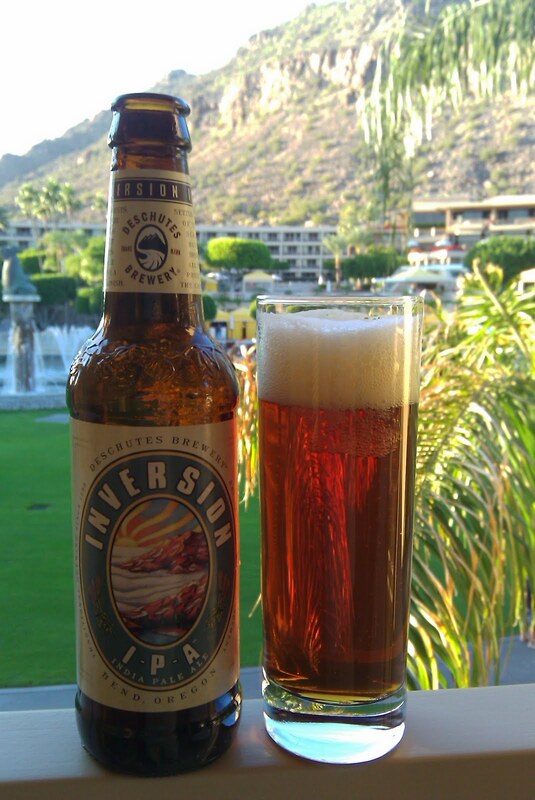 It would be nice to have more local beers available though. Two Real Ale (Fireman's #4, Coffee Porter), a Saint Arnold (Lawnmower) and a Shiner (Bock) was all I saw. I had a Green Flash West Coast IPA to start, followed by a Deschutes Mirror Pond Pale Ale and ended on a Rogue Dead Guy Ale. All were fresh tasting and served in a standard pint glass. Most beers are also available in a half yard beer glass. Overall, its pretty much what I expected. Its an upscale eatery that has a large assortment of draft beer. The prices are a little high, but they do have a good happy hour with half-priced appetizers and pizzas. Beer geeks would probably be disappointed by the beer selection, but that's not really the market they're after. Our side of town has gone without a good restaurant that also has a good selection of beer for a very long time and I have a feeling this place will become our new default location for dining out. Todd Usry from Breckenridge Brewing will be at the Flying Saucer in Houston tonight. They'll be tapping Breckenridge's new Lucky U IPA and Christmas Ale and the Oatmeal Stout will be on nitrous. Beer starts pouring at 7pm. We finally made it to the Broke Spoken Cafe this weekend. I've been wanting to go ever since it was announced that Catherine Duwez would start serving up her mussels there after Cafe Montrose closed. We had originally planned for dinner, but found ourselves in the area at lunch time after running various errands. Fortunately, I recently read on their website that their entire menu is available for lunch, including the mussels. Its certainly not hard to find on Washington Ave with the Belgian flag hanging on the outside. The inside is small but quaint and the bicycle theme is broken up with Belgian flags and beer signs and a small Manneken Pis fountain sculpture. It actually reminded me of various cafes I visited while in Belgium. There was about 4 tables occupied when we arrived and we were told to sit wherever we liked. The staff were friendly and our waitress was able to list the available Belgian beers. I started with a Stella Artois, which was served in the proper glass, while we reviewed the menus. My wife is not a big fan of mussels, so she ordered the veggie omelette off the bunch menu but I order La Complet Belge which includes La Moule Marinière (Mussels steamed with butter, celery, onion, and white wine), Frites (Belgian fries) and a Stella Artois for only $24. I moved on to a Blanche de Bruxelles as we waited for our order and reminisced about eating mussels and frites in Bruges. Our food arrived quickly and the mussels were served in the traditional pot and the frites came with a side of mayo (homemade?). Our waitress suggested a Kwak when I indicated I'd like a darker Belgian beer and it also arrived in it's traditional glass with the wooden stand (cool!). 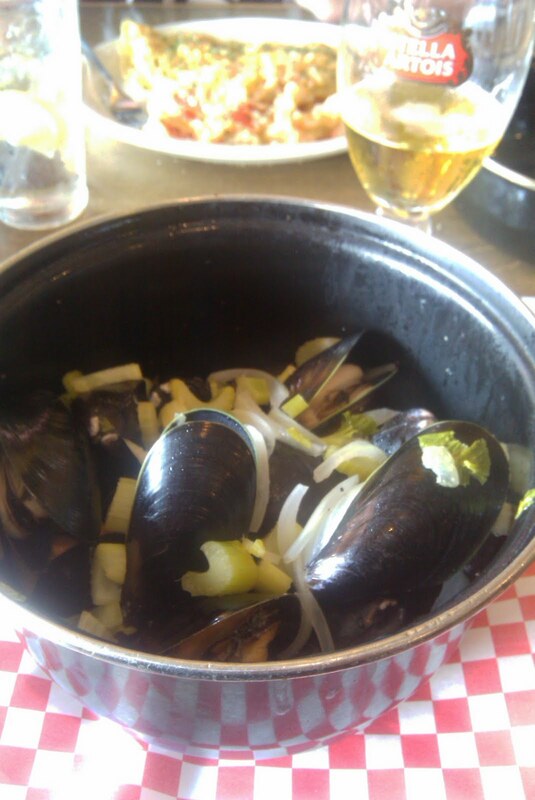 The mussels were all large and meaty with a smooth texture. The broth was light but flavorful which I soaked up with the crusty french bread. I tried my best to finish them all, but I finally called it quits with about 3 or 4 mussels left in the pot. The bowl of frites was empty. I will also mention that my wife's omelette and homemade potatos was great. The caramelized onions gave it a wonderful sweet rich flavour. 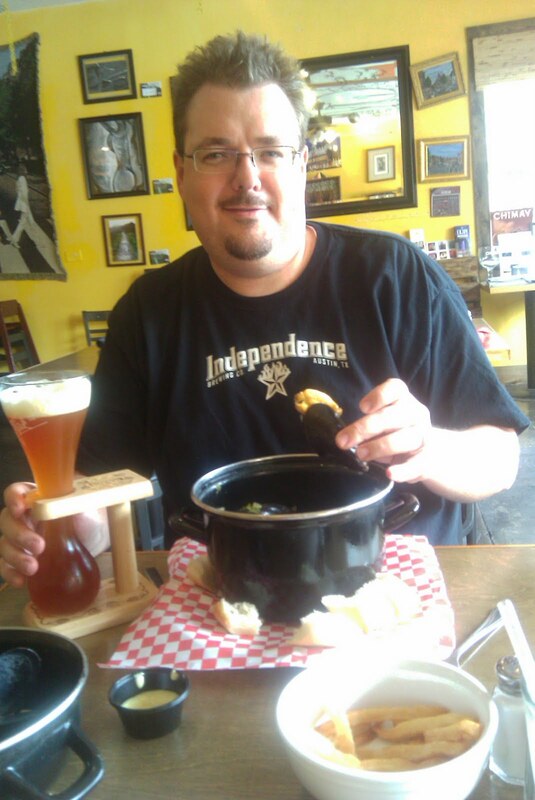 After my original post about the Broken Spoke Cafe back in July, Roy de la Garza, the owner of the Broken Spoken Cafe, has added a couple of comments regarding the Belgian beer they offer. I asked if Roy was available after our lunch and was able to thank him for his comments and let him know how much we enjoyed the food. He said the place can get pretty packed on Friday and Saturday nights (glad we ended up coming for lunch) and also let us know that they have live music on Tuesdays. They also plan to buy another kegerator so they can offer even more Belgian beers. Our conversation was interrupted by our waitress asking him to get a couple of beers that were just ordered. That's when we found out our waitress is his daughter and since she's too young to get beer for customers, Dad would have to serve them. Its great to see his family is involved and we wish them great success. We'll definitely be back, I'd love to try the Carbonade à la Gantoise (Flemish beef stew) and the Crêpes for dessert, but it will be hard to not order those delicious mussels every time. Scheduled to open this fall, the Branch Water is a new modern American tavern located on Shepherd, just a few blocks South of the popular Washington Avenue strip in Houston. The menu will be "seasonally inspired, featuring local organic meat and produce, locally-sourced fish and seafood, and an extensive cured meat and charcuterie program". Sounds great, but what has me particularly intrigued is they also indicate their "Beers will be artisanal" and that the "beverage program will first and foremost be driven to match the cuisine. Cocktails, beer and wine will also change with the seasons". It certainly reads well on a press release, so I look forward to checking it out when they open and seeing how much consideration has actually been given to the beer selection. They do have a website, but doesn't seem to be operational yet. However, you can follow their progress on their Facebook page. It looks like Austin is one step closer to having another microbrewery. According to their blog entry today, Ben and Jud have managed to raise enough capital to go ahead and place an order for a 30 BBL brewing system. Now they just need to find a place to put it. In 2004, the American Homebrew Association established Teach A Friend To Homebrew Day as a fun way to introduce new people to the hobby of homebrewing. It occurs every year on the first Saturday in November and over 600 people were taught how to homebrew last year. The event was recently renamed to just Learn To Homebrew Day, but the idea is still the same. If you know how to homebrew, grab a friend who's interested in learning and brew up a batch of beer with them this Saturday. Check out the all new American Homebrew Association website for more information about Learn To Homebrew Day and the benefits of becoming of member of the AHA. On Saturday, November 7th is the 6th Annual Rescue Rally to help raise funds for local animal shelters and inform the public about the options for adopting rescued animals. There will be a silent auction, raffle, food, fun and of course, great beer! Come out and support a worthy cause while enjoying a few pints. And, in case you haven't already got your fill of Oktoberfest and other fall seasonals, they're having an Oktoberfest & Autumn Seasonals Beer Tasting on Sunday starting at 3pm. 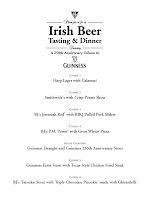 Tickets are $35 which includes food that compliments the beer being served.